I think that most tech geeks and IT people have likely heard of The TWIT Network and may listen or watch one or more of the shows they produce. My favourite TWIT show was Tech News Today, also known as TNT. This was a show developed around tech podcaster Tom Merritt after he left CNet. I have been a listener of TNT since day one, having been a fan of Tom’s previous show at CNet called Buzz Out Loud, or BOL. I was an early listener of BOL, and watched the show that appeared to be a hobby that the hosts produced on their break time, to grow into a fairly big deal in tech podcasting. As a BOL listener I watched as it grew in content length and quality, plateaued for a while, and then went down hill and straight into the toilet, in my opinion. I stopped downloading and listening some time before Tom Merritt left the show and CNet. When he did, I followed him as a listener to TWIT and he carried on a very similar show, that for the most part I enjoyed, but regardless listened to on a daily basis. At some point in December, Tom announced very briefly that TWIT (Leo Leport) was not renewing his contract and was instead bringing in someone to be an in house news journalist, or something to that effect. The way it was worded sounded to me to possibly reflect the fact that Tom originally worked from inside the TWIT building, and then later moved to another city, and did his part of the show remotely. I could very well be wrong about this, but that’s what crossed my mind. As an audio listener it made little difference to me where he was located. As a business owner or manager I could easily see where this could be a concern. His replacement is someone that has been an guest on various TWIT shows from time to time. Someone that I felt made an okay guest, and better than many TWIT guests. But as a listener I find the “new guy” to have a tedious monotone voice that wears on me. And of course he has his own style and direction for how the show, now his show, should go. I’ve listened to the first episode of the revamped TNT and their pre-show New Years episode. And I’m very disappointed with the changes TWIT has made with TNT. Not only is Tom gone, but so is one of the co-hosts, Iyaz Akhtar, who has left for CNet. There was no mention of this prior to the new guy taking over. Leaving only one co-host behind, a very smart and capable co-host named Sarah Lane, a well known cord-cutter, but also very long winded at times. I’ll miss Iyaz on the TNT show, as he developed into a competent and interesting co-host. Unlike Tom, the new guy is painfully monotone, long winded and currently seems to not have the journalist skills of knowing when to cut a guest off and inject some content, or change a subject, letting the guest go on and on far too long. All these changes are very disappointing, not only due to simple change, but a change to a less interesting and pleasantly sounding host, but also a loss of a good co-host. It obviously isn’t going to be the same show at all. So why keep the same name? I suppose to keep the existing podcast feed followers. Unless miracles happen with TNT, I’m pretty certain I’ll be deleting the TNT feed from my list soon. And if not it certainly won’t be at the top of my listening list anymore. I no longer look forward to listening to TNT once a weekday. It will now be an experiment to see how long it will take till I remove the feed from my phone. The sequel to “The Chronicles of Riddick” from 2004. One of my favourite Sci-Fi movies of all time. The previous movie ends with Riddick becoming the ruler of the most powerful society in the known universe. With that in mind, and the possibilities that this leaves us for a sequel, this instalment in the series is incredibly sad. In fact this is more a sequel to “Pitch Black” which is equally slow and boring and took place on a barren planet with every creature wanting to eat him. 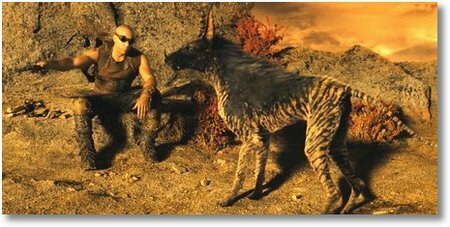 Riddick is basically a remake of Pitch Black. Our sequel to the bigger than life “Chronicles” is a low budget flick with only a handful of actors on a conveniently barren planet, so most sets are computer generated on a green screen. Audio quality is horrible. Not that you can’t hear the actors, you can hear them very clearly, however in most scenes they sound like they are in a small room, and you can clearly hear the faint echo of them speaking in a small space. Especially when they are out in the wide open plains of a desert. There is rarely the sound effects of wind or actions around them. Generally you only hear perfectly clear voices and the obvious sound effects of what you are looking at, rarely any background noise, so most scenes seem strange to the ear. So you sit there wondering why it looks so real but feels so fake. Action is decent and special effects and CGI are quite good. In particular his “dog” ends up being a fun and key character. The writing is barely passable. The story line is weak, obvious and completely predictable from start to finish. This movie should be rated a 3, but I enjoyed the action and computer generated characters and effects.